The poet Ted Hughes (1930-98) was born at Mytholmroyd in Yorkshire and studied at Pembroke College, Cambridge, where in 1956 he met Sylvia Plath, marrying her soon after. His dominant concern with the vitality and violence of nature was tempered by a lifelong interest in classical mythology and children's literature. He was created Poet Laureate in 1984, succeeding Sir John Betjeman. Hughes was appointed to the Order of Merit in August 1998, two months before his death in October 1998, and his portrait for the Order of Merit series was therefore based on photographs by Jane Bown and Caroline Forbes. Bob Tulloch attended the Ruskin School of Drawing, Oxford, and the Royal Academy Schools and has exhibited at the Royal Academy, the National Portrait Gallery and elsewhere. Although he works in a wide variety of media and on very diverse subject matter, he now concentrates increasingly on portraiture. The Order of Merit was founded by King Edward VII in 1902 and is a special honour awarded to individuals of great achievement in the fields of the arts, learning, literature and science. 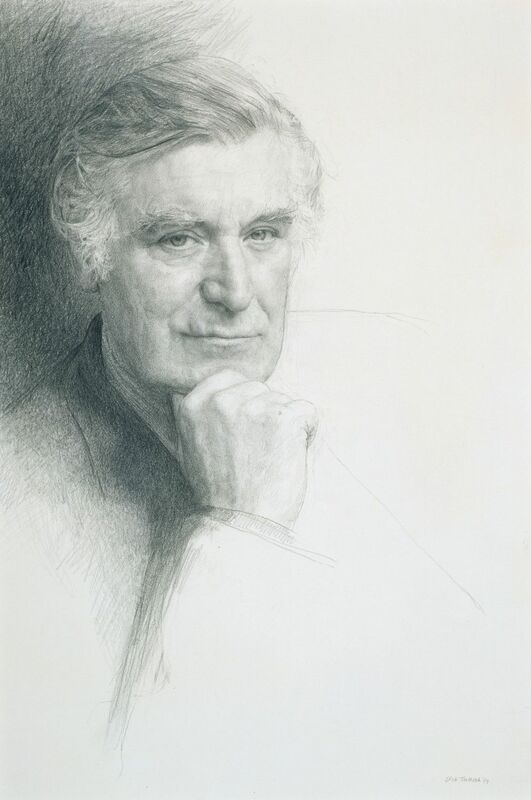 A portrait study of Ted Hughes, head and shoulders with right hand to chin, slightly turned to his right looking at the spectator. Posthumous, from photographs. Signed lower right "Bob Tulloch '99".